Home > Companies Q&A > Managing Remotely > How do you measure the productivity of remote workers? It’s actually a lot easier than leaders in brick & mortar environments expect it to be. We are results-oriented by necessity. We’ve identified key metrics for most of our team that allow us to see results. We also have team meetings that focus on progress, plans, and problems. It allows individuals to update on projects that are in motion, what is coming next, and any blockers that might be slowing them down. There are many studies showing that remote workers are actually more productive than their in-office counterparts. It simply requires managers to be focused on the tangibles instead of who is physically present. We try not to measure productivity. Instead we value working with passion. If someone is not working with passion then we want to know why. We try to get to the root cause and address it. We are always doing this. Measuring a person can be dehumanizing and demotivating so we are thoughtful about how we do it. We work closely and we care about each other. Maybe we are just nosey, but we know what’s going on with each other. If productivity is down due to a new baby, we try to help. If a person is bummed out about their job, we want to know why. I’ve noticed a phenomenon in our company: if one person is not doing well, others will swarm in to help them. This is great, but can also cause trouble if it keeps happening to the same person or the person is not acting within the core values. How do businesses measure productivity of co-located workers? By how busy they appear to be when you walk by? By whether they enter the office at 9 am and leave around 5 pm? Any business that effectively measures employee productivity surely isn’t relying on anything having to do with physical location. 10up is an agency, so most staff track their time (for us to bill hourly or measure against fixed fee estimates); and our team leaders review and authorize those entries weekly while also maintaining project budgets; it’s pretty apparent pretty quickly if a budget is being blown by an employee who is not pulling their weight, and it’s in a manager’s’ interests. We also adhere to many agile project management principals, with granular tasks (weekly milestones at most, sometimes daily) – we know pretty quickly when staff are off the reservation – faster than most co-located shops I’ve worked at. We use Basecamp and other calendaring tools to plan out our goals and strategies, whether it’s a week-by-week marketing plan or a development timeline for the software. If we’re checking off tasks on Basecamp in a timely manner, we’re hitting our productivity goals. Strictly speaking, we measure it in their output. What’s most important to us is that the work needed is getting done, and that our team members are putting in their best on every project, delivering high quality work. We do track time (using Harvest), but that’s for project analytics rather than to keep tabs on how many hours our team members are logging and when. We focus on output rather than time spent. We track our weekly goals closely to ensure that we’re doing what we set out to do. 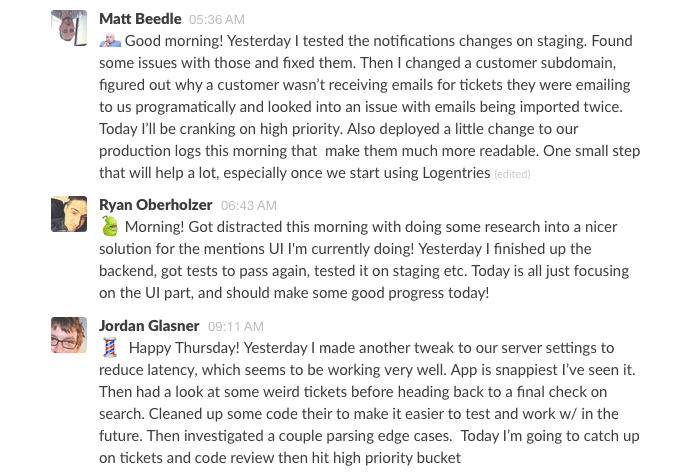 We also have daily standups in Slack where team members share what they did the day before, and what they’ll be working on that day. It keeps us all on the same page as to who’s working on what. Nobody works alone at Scrapinghub. Everybody reports to a manager that keeps track of their work and this feedback moves up the chain, as it does in any standard company. It doesn’t need to be different for remote working companies. If you need to keep your employees close to check on them and make sure they’re not on Facebook, then you should not consider building a remote working company. Remote working companies need to build on trust. Productivity is fueled by motivation. So, rather than asking how to keep your workers (remote or not) productive, you should ask how to keep them motivated. Motivation varies a lot per person. Whether it’s their professional development, contributing to open source projects or working on challenging tasks, you need to know the priorities of your employees and strive to align their work to them, within your company’s constraints of course. At Toggl, we have a result oriented culture and everyone’s productivity is measured by their results. We have small teams working together: back end team, front end team, mobile team, marketing team etc. Every team sets their own goals and works towards achieving them. We also track time with Toggl but the productivity is measured based on the results and not on how many hours you have been working. It works perfectly as we put in a lot of trust into our coworkers. We set goals and deadlines, the same way we would if our team was working in an office together. The team here at Batchbook works really hard to meet the company goals and we use some different apps like PivotalTracker and BaseCamp to track our progress. For us, remote doesn’t just mean location independent. We want to give people as much autonomy as possible about when and how they work too. The hours people work or the tools they use aren’t that important—what matters is results. Is this person doing important work? Is this person working effectively with their team? Is this person actively supporting GitHub’s long-term goals? These are the things by which we measure how someone is doing. I don’t think this challenge is all that different for remote workers – someone can be onsite and unproductive just as easily as someone can be remote. That said, we look at tasks accomplished and focus on measurable goals so that we can easily view progress and productivity. In many cases, it is activity in Slack, commits to source control, responses to clients, etc. It’s challenging, but from experience of working in traditional environments the productivity of our team is some of the highest I’ve ever experienced. We do not. It either works or not. The mutual feeling has to be positive and the client has to be happy. There’s really nothing else that matters. We don’t actively measure anything like work output. Everyone is quite honest about their flow and usually it’s quite clear from the amount of product that is being built whether we’re working fast or slow. By their outputs. This is the fundamental shift with remote working. We don’t focus on inputs of hours worked, widgets stacked, queues cleared etc. We focus on the outputs of those things like NPS, Apdex, conversion and churn rates etc. The output is the part of each other’s work that we see and value. The output of our work is how we communicate with each other. We’re very selective about what we measure. We care about goals achieved, not hours spent in a chair. We don’t micromanage, and we don’t track hours — everyone can work during whichever hours are best for them. These philosophies necessarily extend to our hiring practices as well. Everyone here is highly motivated and capable of being extremely productive with very little oversight. That being said, accountability is very important across the company, and we hold each other to a high standard in this regard. One way we do this is by having everyone send weekly recap emails of what they did in the past week, what they thought it would achieve, and what the results were. This makes the impact of everyone’s work very clear, and it quickly becomes obvious if someone is underperforming. It also helps to have a single KPI around which everyone in the company can rally (new clients, revenue, a launch date, etc.). This helps individuals and teams to better see the impact of their work and allows them to increase their productivity by being smarter about how they focus their efforts. We’re a pretty flat organization, but having everyone regularly put together impact-oriented reports to whoever is above them in the hierarchy tends to be a good way to promote accountability. We measure productivity the same way traditional office workforces measure it – we look at the results. Being a remote workforce truly shouldn’t be a large factor in measuring productivity. Some of our teams operate in the Agile methodology of project management and development, and the teams themselves are self-measuring. The accountability that members of an Agile team have to one another pushes everyone involved. Other non-Agile teams such as customer service have their productivity measured much like their traditional office-based counterparts. Customer satisfaction and metrics are used in a remote setting just like they are in a traditional office. One of the core Envato Values is that we ‘focus on results’. One of the biggest myths about remote working is that people won’t work hard enough. In fact, the opposite is often true. Without the daily commute or distractions of an office, remote workers can be incredibly focussed on the task at hand. Each manager is different, but it’s fairly easy to spot when a team member is not pulling their weight. At Envato we focus on results, not how many hours someone is sitting at their desk. Outputs are more important than inputs! All of us have yearly “people plans” that tie us to our goals and what’s required. Every one of us tracks all of our time so that we can measure ourselves and keep on track. Again, this is about Leadership 101 in some ways. Meaning, every worker needs to have clear expectations and clear feedback — no matter where they work. The Hubstaff software has useful features like activity levels and randomized screenshots, so we can see how productive our team members are being while tracking time, as well as gain a clear picture of what we’re all working on. We’re a very results oriented company, but for client services work depending upon the contract type we do track hours and do things that are pretty typical business practices for keeping track of our levels of productivity. We are experimenting with OKRs at Mokriya. This is a simple way to keep the team aligned and measure progress on a quarterly basis. By having brief daily huddles, it is also possible to measure progress on a day-to-day basis. We measure all workers- by what they produce. Productivity is measured by team leaders on each team, and it depends on the nature of the team. For example, support teams are measured by the number of tickets answered, customer’s rating, pace, etc. Our ultimate goal is to make our clients happy with fast and efficient support. On the other hand, the efforts of the marketing team directly affect our sales, so it can also be relatively easy to track the progress by what is working and what is not. So, basically, we use different ways to measure productivity across different teams. Through project management and time tracking tools. It’s different for each department, but in most cases it really comes down to metrics and goals. We’re still a super small company, so it becomes pretty clear when someone isn’t being productive relative to his/her colleagues. We don’t really measure on a hard metric like ‘units touched’ but it’s quickly apparent where any deviations appear. Productivity is easily measured by the output each day. Our platform provides metrics which will show the productivity of individuals and the company. We also have daily sales and operations goals which clearly outline how productive a day it was. We have a host of metrics that we ingest from several sources and make visible to our team using a Periscope Data dashboard. Each team member has a set of metrics that are important to his or her role. In our weekly one-on-ones, my partner and I review performance and provide guidance and coaching, and we put our weight behind organizational change and improvement when we find that the organization is doing something that is making it hard for someone to be successful by our measures. We give our remote workers a lot of freedom. Every order placed through Scribendi has an accompanying deadline selected by the client from the available turnaround times, and our remote editors then select their own assignments based on their preferences and desired work schedule. As long as the editor completes the work in an appropriate manner and returns it by the order’s deadline, we don’t interfere with their process. We hire experienced, professional editors, so we trust them to manage their own workflow and avoid micromanaging. In offering autonomy to remote workers to determine their own productivity, we create a team of engaged professionals that together can meet the needs of the team. We are all held accountable to performance goals and we are measured on our contributions. We rely on the outputs from both independent and team work to understand how individual [A]gents are doing. We also are able to evaluate detailed time logs, kudos received from other [A]gents, client feedback, project quality measures, and overall performance of an account team, practice group, or knowledge area. We find it helps to have an object-oriented system of record, which allows for taxonomy relationships, or tagging to relate knowledge areas, industries, expertise, skills, practice areas, geography, along with an [A]gent and clients with which they work. We measure the productivity of our teams by the success of project milestones. We estimate the required effort for every challenge we take on and then do our best to meet our goals. When a group of people value transparent operations, it’s easy to see when problems arise and we can quickly adjust accordingly to ensure we meet our goals. Overall, our productivity is very high and our customers are often amazed by our proposed (and met!) timelines! We’re an Agile organization, so self-examination is built into our workflow very naturally. We set goals, then examine and measure progress, output at regular, discrete intervals. Being so small, setting formal KPIs is still down the road for us as a formal process. We keep pretty good track of each other, and the team self-organizes really well. It’s pretty obvious if there is an issue, and I can act very quickly to address it. We don’t stress individually productivity too much, but we have metrics for each functional area that we try to improve all the time. RJMetrics makes it easy to build and share metrics so everyone can see how we’re doing. Results. No different than a brick and mortar business. It depends on what they are doing. We have two people that handle support emails. It’s very easy to run reports and see their activity. As for others, we plan out our projects in TeamGantt and they can update their progress as they complete their tasks. We can also use TeamGantt to see how their workloads are coming up for the next few weeks. By the quality and quantity of the work they output, period. We only look at output, not effort put in. We’re still running on a single product backlog in weekly sprints, so every Monday everyone gets to report to the team what they accomplished the week before and commit to what they will in the next. We do set quarterly measurable product objectives as well (OKRs) but keep those on the team level for now, not individual. We set clearly defined metrics for all of our team members every quarter. This empowers everyone to work smarter and get their work done without worrying about putting in “face time”. As attorneys, we measure productivity through billable hours generated by the employee. I think this is a very important question for all organizations – not just organizations with remote workers. Too often a “flexible workplace” turns into a workplace where people “flex” their work into evenings and weekends as a way to catch up on work. But when workers are in a chronic state of “too much work” – it is likely they become less effective, efficient and creative. ThirdPath has developed a number of tools to help people prioritize their work so that they can make better decision about how they use their time at work. The tools also help them easily communicate how they are progressing on their most important work. This helps employees manage their productivity while also creating time for their lives outside of work. We’ve also had a lot of success helping leaders and professionals use these tools. As an organization, we hire really driven people, set clear and ambitious goals, and check in on them regularly throughout the year, both formally and informally. We treat our people like adults, and we expect results. Our focus on outcomes gives us all a strong vision of what success looks like, and our focus on regular communications between managers and team members ensures that we can quickly see if a project is off-track or needs more resources or support. We measure objectives, not working hours. We do hard work in programming our development iterations and business goals. You need to master the art of programming and timing, and you need to have a great understanding of your team’s pace. Once you do, you can start to break down tasks properly and define goals. When anyone has goals assigned, the process of evaluating productivity, as well as evaluating team members, is way easier. We focus more on priorities than on numeric goals. We set then frequently adjust those priorities. Productivity is measured by how much progress we make on those priorities in a given time frame. Clear goals and targets. And a time management system. We don’t- the culture around productivity is the same for both office and remote- get things done. I am very fortunate to have an incredible team of consultants. They are self-starters who work until the job is done. This type of work includes very long hours and if you don’t have passion for this type of work, you simply can’t make it in this business. There is no closing time here. We use an agile development methodology that incorporates daily progress checks for the team. Also, if a developer’s velocity falls below a certain threshold, we can remotely detonate their computer. This is very hard. We use a system called OKRs (objectives and key results) for everyone, and do quarterly reviews. As the CEO I like deliverables—I am not big into the value of culture and feeling good outside the context of delivering on commitments. So for me it is about delivering what you say you will do. At the same time we have found that discussion often leads to better solutions to problems. We have these chats quite often, sometimes prompted by someone getting stuck on a problem and just wanting a chat to share the thinking requirement. This has lead to some real breakthroughs that have developed amazing functionality, or dramatically reduced the work needed to deliver. It’s not a perfect science; we have had situations where employees were “skating” for a month or so and we did not notice. But, eventually you notice, no matter what. You have to use a sixth sense sometimes, but mostly we know when work is not getting done, customers are not being taken care of, or if people seem distracted by life. Productivity isn’t black and white and therefore measuring it requires an understanding of the work being done and the people doing it. In short, it comes down to the relationship between team members in overlapping roles. Are we accomplishing our goals? It’s really up to the individual to assess their productivity. As a team, we focus on group goals and results. Periodically we revisit those goals, our performance and take a time to assess, learn and set new short term goals. In our line of business, our team’s productivity is measured by our clients’ satisfaction, and so it’s a relatively easy gauge of performance! We have made a concerted effort on hiring outstanding team members and so we work hard to empower them to do their work and what they know best – support their clients with premium help, and a heavy dose of care! On a practical level, last year we built proprietary software, which allows our team to log their hours that they do for each of our clients. Our clients are able to login as well and see tasks that have been done on their account. This provides transparency and builds trust, and any issues about productivity and performance can be addressed more easily. We’re lucky to be in the development industry where there is a plethora of tools one can use for tracking, such as project management tools like JIRA where most development gets tracked in many ways. Remote teams live and die by each person’s ability to keep things moving forward. It’s the only way to battle the timezone, communication and trust challenges that come with this setup. So although project management tools can be helpful in tracking productivity, you’ll want to be far more aware of each team member’s progress on a daily basis rather than waiting to find out in 2 weeks that deliverables are missing. It goes back again to journaling and finding ways to have a deliverable every day, regardless of whether it’s something ‘tangible’ or a list of updates on progress made with some evidence to back it up. The more trust each person contributes by showing progress of moving things forward, the stronger the team will be and won’t have to worry so much about constantly tracking productivity. We measure productivity through the results we deliver to our clients. We also use tools like Harvest for time tracking, and quarterly check-ins to make sure everyone is on track with their core job responsibilities and individual goals. We are software developers, so we use a variety of tools to track objectives, milestones, and the resolution of technical issues. Our support team monitors email inboxes, social networks, and forums. It’s very easy for us to monitor productivity: if questions are being answered, bugs are being marked “fixed,” and customers are happy, we’re doing what we’re supposed to be doing. As with all of our customer care professionals, the primary measure of success for people in our virtual organization is how they deepen the relationships with customers. Recommend to a Friend – or RTF, our own service-specific version of the popular Net Promoter Score – is the primary metric we use to recognize and reward our front-line employees. This helps turn our customer care organization into a group of passionate advocates for our customers’ needs, and it reinforces our service ethos, which states that every interaction is an opportunity to deepen relationships with Card Members and merchants. Our front-line live answering employees (Customer Experience Associates) work within a carefully constructed framework. Regular QA evaluations, including listening back to recorded calls, help us keep our standards high. Our software for distributing the calls, emails, and chats we handle for our clients includes precise measurements, so we know how much downtime associates have between calls, for example. Our employees are incentivized through a transparent system that includes giving our top performers first pick of the shifts they want to work. The most productive and effective team members have the most flexibility in when they work, in addition to being able to work from home or any suitable remote environment. For employees who work in other departments, sharing updates on their work and knowing the results we are looking for is essential, and we do that through software we have developed in-house. They have KPI expectations for their call handling, quality, and attendance. They log in to a remote server for work that captures all of their activity. Depends on the roll, but in most cases it becomes very clear who is productive and who isn’t. For engineers github is key. We employ an Objectives and Key Results (OKRs) approach to personal (and team-wide) progress. Each quarter we sit down and discuss what we’ve done over the past three months, and align everyone to the upcoming quarter. Each team member has a few specific and quantifiable metrics we’re aiming to hit, each of which lead to greater company wide goals. We always want to be sure the entire team is aware of, and involved with, where the company is headed. Since almost all of our communication is through writing, it’s easy to see who is making progress on their goals through updates on the P2s, lines of code committed, or pull requests. It varies based on the jobs but in general, we try to be results oriented. For example, for sales reps, it’s pretty cut-and-dried, in that, they need to meet quota. For product, support and other departments, it’s based on completing projects in a timely fashion. We discuss weekly plans in depth in our 45-60 minute weekly meetings at 10am ET and check in daily, also at 10am ET, in a quick 5 to 10 minute “stand-up” meeting (based on Agile methodology but applied to all departments in our company). We don’t track time or something like that. We care more about outcome and measure KPIs that are related to how the product and our processed perform. We trust each individual employee to do their best work and create an environment where this is possible. We try to be empathetic with everyone and support each other wherever possible. We agree upon targets with measurable results for all our team members, allowing them and us to keep track of their progress. The reality though is that if you hire people who are well-suited to working remotely, they will respond better to encouragement and the freedom their location-independence offers as opposed to a more rigid and structured environment in a physical office space. We have sales and other deliverables which are measurable. I think it more difficult to measure the productivity for roles that don’t have clear deliverables with results attached to them. We look at a lot of different metrics – from crude things like time (it’s remarkably easy to see if someone is “showing up” and giving their all each day when working online), to deliverables, impact and if goals were met. We’re still a small team so things are tight-knit and highly synced. It gets much harder at 50 people, then 100 people and so on. For external staff, we conduct weekly and quarterly audits of their work. We have a 3-strike system for any instances where it is clear that productivity and/or quality is suffering. Consultations are also provided via virtual office spaces or by phone/webinar. With remote work, you measure each employee’s output based on what they actually produce – not how long they spend in the office. This makes it very easy to determine who’s doing what on our team. At Collage.com, we measure results over appearances. Each employee also has one-on-one meetings weekly with his or her manager, which ensures constant two-way communication and clear expectations. We use a productivity-tracking tool called Worksmart, which helps managers and their team members assess how team members spend their time. Worksmart has a variety of features, and you can customize them based on how in-depth you would like your metrics to be. For example, the most in-depth tracking involves screenshots and webcam grabs, as well as a list of the applications the team member has used (and for how long they’ve used them). If this level of tracking is unnecessary, any of these can be disabled. But our whole company uses all the features–even the CEO gets his picture taken, just like us. It’s great to see how much time we spend on any given project. In fact, clients who use Worksmart with their contractors have found that their team’s productivity increases by 40-50%, mainly because managers and team members can find out where any unproductive time is going, and work to fix that. We measure productivity of remote employees the same way we measure for non-remote employees, by output and satisfaction of their downstream customers (internal or external). Seeing you in a seat isn’t something we measure. Depending on the type of work, we have different KPIs and have developed a business process that allows measuring most of the day-to-day activities. Development tasks are usually being estimated by technical leads so that developers can maintain a specific pace. We do weekly reviews of our technical team and their performance, and communicate possible delays or code quality drops when referring to conventions or best practices, as well as code samples from fellow developers in the team. Design and front-end tasks are also scheduled and measured based on a large number of successful projects and the time we spent on building different components. Marketing members follow the company strategy that includes different aspects, which are also broken into time blocks – from a ballpark for researching and writing an article with a given length, through building a social media plan for the next couple of weeks, to building an automated email course. The sales team has a quota based on different criteria and industry standards. We’ve experimented with OKRs and Squads but they haven’t worked or us. Ultimately, we created our own hybrid of the two systems – goals and squads – in what we call the DO (Doist Objective) System. The system is output-focused rather than outcome-focused which means that our quarterly goals consist of things we have full control over shipping. We feel like the DO system is a better fit for how we work – light on process with a focus on shipping concrete things quickly – and addresses the big issues we are now facing in coordinating a larger team. We monitor both hours worked and hours billed to clients. Virtual assistants describe the work they do each day, which allows us to assess productivity. When looking at developers the code quality is essential. We focus on output, not on working hours. We are a very metrics-oriented company. Every employee knows the company’s annual and quarterly Objectives and Key Results (ORKs) and corresponding Key Performance Indicators (KPIs). On a quarterly basis each employee reviews their previous quarter’s results and also sets individual OKRs for the upcoming quarter. It’s an exercise that keeps us very focused and enables all employees to prioritize their work on a daily basis. Through our annual review process. We simply ask, 1) What were your key accomplishments? 2) What lessons did you learn? 3) What are your top goals for next year? 4) What skills do you want to improve? and 5) How can your manager help you? Productivity is roughly equivalent to answering two questions: 1) Am I meeting the goals I’ve set out? and 2) Am I gaining progress on key projects on a daily basis? For us, we’ve built a powerful tool designed to increase team satisfaction. It’s called Jell. Jell allows you to communicate your daily status to your team, track goals, and give teammates feedback along the way. It has been a great tool to help keep a pulse on things in our respective departments. Work is seen by the team. We notice output and their work speaks for itself. We all contribute in everything we can besides our regular job tasks. Everybody shares and we can all see everybody’s contributions. Our main tool for managing work effort is Basecamp. We use that both to schedule out the work that needs to be done as well as a review tool to see what was completed as well as the quality and timeliness of it. For each new project, we have a lead designer and 1+ team members that create proposals and timelines that match up with client expectations. We also have a peer review system to ensure high quality and out-of-the-box thinking. Finally, we reach out to clients to provide feedback on each of their projects. With all of these factors combined, each GobySavvy expert receives a score which allows us to measure and reward great performance. Our work is very data-driven and analytical in nature, requiring near constant review. We monitor our digital ad campaigns very closely. It would be pretty easy to spot a productivity lapse. We are also a very flat organization without a lot of layers – each person’s job matters, and it is easy to identify who is dropping the ball. Weekly updates are detailed reports we receive every Friday that outline what each team member accomplished during the week and their focus for next week. This is also the place for team members to let us know what specific input they need from us to push projects forward, explain any delays or issues they encountered, and address any concerns they have. Quarterly goals, which are developed primarily by the team members themselves, exist to keep team members focused, productive and accountable. While everyone has projects to work on that must be completed regularly, the quarterly goals speak more to the success of the business overall. Each team member has very detailed goals tied to specific metrics to evaluate success. We measure success based on contribution, not on number of hours worked. While some companies’ worry that remote workers won’t work their required number of hours since no one is there to watch, we have the opposite problem—our team members generally work too much! This is also a problem, as it leads to burnout. So we encourage our team to take time off and enjoy a proper work-life balance because it benefits everyone in the end. We focus on output and results rather than trying to track input hours. Many companies go remote and then focus fanatically on tracking how long everyone is working, to try and keep control of their teams when they can no longer ‘watch the desks’. That’s just a recipe for frustration, both with managers and also their teams. We’re a digital company so it’s easy to measure output: code commits, blog posts, leads generated and work completed. But we also find tools like WeekDone to be handy. They help us to cut through the ‘noise’ and see a really concise summary of what everyone else on the team is up to that day or week. Everyone is responsible for punching above their weight. While the expected is 40 hours a week, everyone is well aware of the work and projects that need to get done. We’re pretty hands off here. We still have a startup culture and everyone is working very hard. It hasn’t really been necessary to get too measure-y. But, as a remote worker it’s MUCH harder to hide your non-productivity. In an office you can do absolutely nothing but appear very busy. Not so remotely. You must show results, or you get caught. We work with project management tools and have set goals and KPIs. We rely on Asana, a project management tool, to keep track of projects and due dates. We’re only five people, so we’re not yet in a position where we have to measure everyone’s productivity. We estimate how long projects take. Sometimes they slip and in a post-mortem discuss why that happened. And then we change things. We aren’t too formal in this area, but our project management tool keeps track of everyone’s tasks as they are completed. The entire team can see the status of a project and how much work is completed and when at any time. We are not actively measuring the productivity of our workers, but if someone is being lazy or not concentrated, we will recognize it and have a talk with him. We measure the productivity via deliverables – mainly that projects are done on time, the client’s needs are attended to, and client satisfaction surveys are positive. Productivity is purely based on results. Measuring productivity is the same regardless of where someone is located physically. If they are in the cube next to you, they can be as unproductive or productive as across the country. We do 360 peer reviews and have a silly weekly award that one employee can give out to another for great work. We operate by a billable hours model, so we have utilization targets for staff to meet, but the ultimate performance and productivity measure is always in the quality of the work. Ultimately, we measure our team’s success by the happiness and success of our clients. Here, we might distinguish ourselves from other remote companies. We pay everyone by the hour. Everyone is using a time tracker. Unfortunately, we experience that around one in 15 cheats. I’d love to trust everyone, but one in 15 is too many. We’re working on a more natural system for trusted employees who have been here longer. I’m not fond of the current tracking system—it feels wrong, but at the same time necessary, for now. Everyone can work as much as one likes with a minimum of 25 hours per week on average.